The remote southwest corner of New Mexico, south of I-10, is one of the least-visited parts of the state - there are few roads or villages, just lifeless mountain ranges separated by desert basins, dry lake beds and lava deposits. Several ghost towns are hidden in remote places up in the mountains, relics from mining activity early this century. Silver and to a lesser extent gold were mined quite extensively, and the geological richness is evidenced by various minerals and semi-precious gems that may be found across the region. One such location is the Little Florida Mountains, 11 miles southeast of Deming which is an easily reached site, close to the interstate. Part of the hillside has been incorporated into the Rock Hound State Park, and this makes an ideal overnight stop for cross-country travellers, even those not particularly interested in collecting rocks. The park has a particularly fine campground, with good facilities, spacious sites and commanding views over a large area of flat desert land to the west (full hook-up sites cost $18 in 2011). It is unusual in that visitors are encouraged to prospect and remove specimens, subject only to a 15 pound weight limit, unlike most national and state parks where removing natural objects is forbidden. 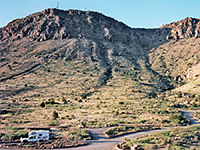 Behind the campsite, steep rocky cacti-covered hills rise several hundred feet above the desert. Occasional good mineral specimens are scattered all over the area, but the main location is a shallow ravine towards the south edge of the park. A 1.1 mile loop path runs over the lower slopes from either side of the campground; the ravine is reached by walking a few hundred meters along the south end of the path, then scrambling up the hill a little. Despite the reputation of the park, it is not particularly easy to acquire good mineral specimens. The main mineral that may be collected is jasper (chalcedony), a hard material that occurs in various colours including a red, white, pink and an attractive whitish banded agate form; the jasper is mostly found as small outcrops in solid rock and so requires lengthy chiselling to extract. Geodes, and a similar nodular variety of jasper known as thunder eggs occur in bands of softer rock, but obvious veins have been excavated to a depth of several feet; again some time and effort is necessary. One material easy to find is perlite, a shiny black glassy rock that is exposed at various locations in prominent deposits several feet thick from which it is simple to break off smaller pieces. Generally, prospectors should come equipped with a large hammer, several chisels and a spade, and be prepared to spend several hours on the hillside. The nearest towns with hotels close to Rock Hound State Park are Deming (11 miles) and Las Cruces (58 miles).